Leisurely traveling alone…or just enjoying good times with a group or family. 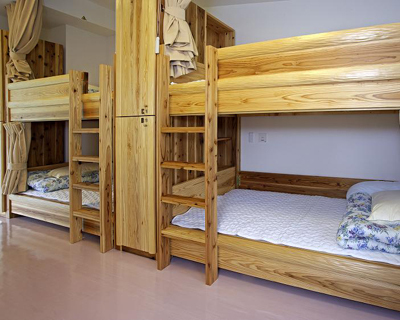 Youth hostels have accommodations for many styles of traveling. 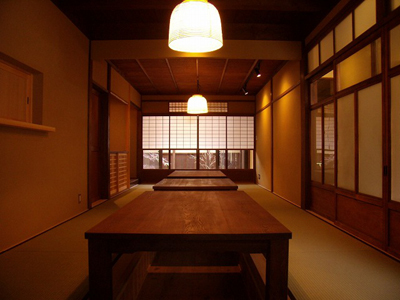 Here we’ll introduce the 5 youth hostels in Kyoto. 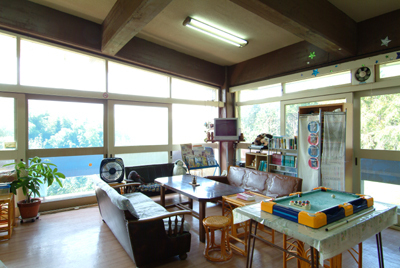 There are several hostels each with their own features. 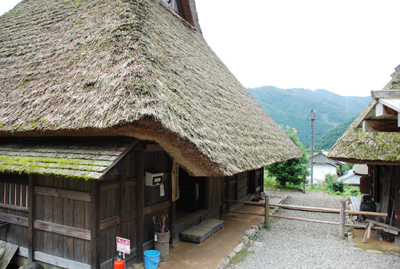 There is a youth hostel that is a relocated thatched roof building, a machiya style hostel that melts into the surrounding scenery, a hostel at Amanohashidate, one of the Three Views of Japan, and convenient youth hostels close to shopping districts and sight-seeing spots. How about a trip that adds a youth hostel to your many Kyoto travels, the highlights and experiences of the history, cultures, traditions, scenery, and nature of Kyoto? 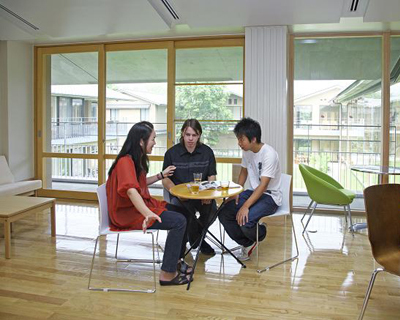 Please enjoy your travels in Kyoto meeting other word travelers, especially at youth hostels. 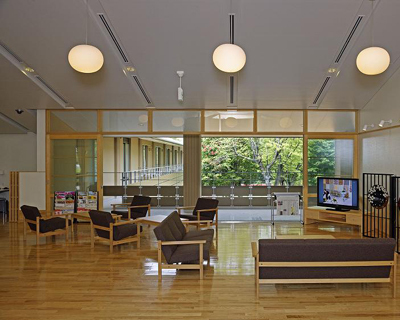 Kyoto youth hostels will support your trip. 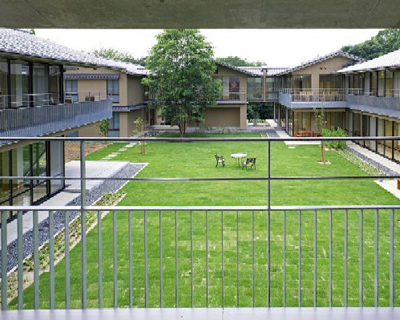 Within Kyoto, its quiet shape is in a place you wouldn’t think abundant with green. Full of highlights such as close to Ryoan-ji, Kinkaku-ji, and Arashi-yama. 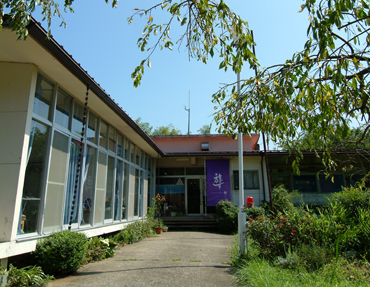 An international youth hostel with many travelers from abroad. You’ll have many chances to meet and interact with others. Currently it has been completely remodeled at July 2008. Get off at Kyoto Station and take city bus 26 from bus stop B4. Or, from Keihan Sanjo or from Shijo Kawara-machi, take bus 10 or 59. Or, from Hankyu Saiin Station take bus 26. In any case, get off in front of the youth hostel. It’s about a 1 min walk from there. On the road to Kiyomizu-dera Temple in Kyoto. It has been open in April 2008. Three minutes walk to Kiyomizu-dera Temple. From Sannen-zaka and Ninen-zaka, Kodai-ji and Yasaka Shrine it’s about 10 minutes. 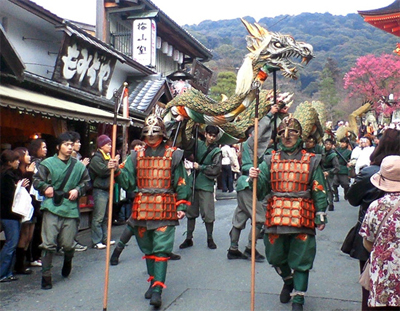 Walk to Higashi-yama for the most idea spot in your Kyoto sightseeing. Chawan-zaka since ancient times has been a pottery town lined with many ceramics shops. During the day many tourists bustle around, but at night it becomes a quiet residential area you can leisurely stroll and enjoy. 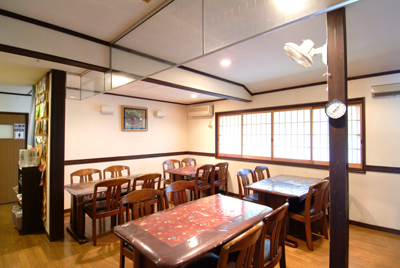 This hostel was originally an old house built in the Showa period, but because of various restrictions that came about it was torn apart and was rebuilt as an “inn both old and new” reusing the main pillars, beams, and fittings. 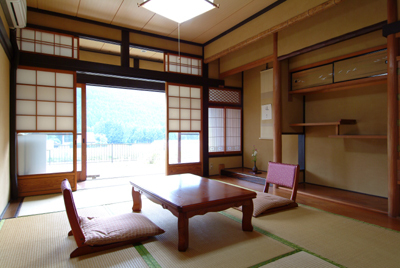 Please enjoy the charm and appeal of this Kyoto machiya home at Kiyomizu Youth Hostel. ・10 min from Kyoto JR Station, city bus stop D1, take route 100, or from stop D2 take route 206. Get off at Gojozaka. Cross the street and climb Chawan-zaka heading toward Kiyomizudera Temple. Turn left t the sign that says “Ｐ東五六駐車場” (a parking lot). The Youth Hostel is in front of the inn called “吉田屋” (Yoshida) and walk 5 min from the bus stop. ・From Keihan Gojo Station walk 15 min towards Kiyomizudera Temple. 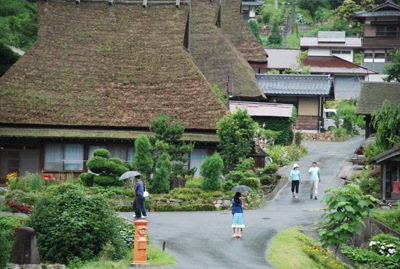 A youth hostel in the scenic beautiful mountain village Miyama-cho. Good atmosphere like a refuge of a relocated thatched roof home from about 170 years ago. Snowy landscape of old mountain peaks, a valley of autumn colors, the clear flowing Yuragawa River. 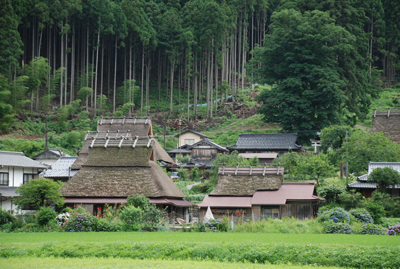 Fully enjoying nature is the allure of Miyama-cho. From Kyoto Station take a train to Wachi Station. From Wachi, ride the bus to the youth hostel. The appeal of Tango Peninsula is how it differs from inside Kyoto; the translucent sea, the green mountains, the clean water and air. Enjoy bathing in the sea in summer, eating crab in winter (reservations needed), and all the seasons. There are many hot springs flowing on the peninsula. There are also family rooms available families can enjoy. ・From the Kitakinki Tango Railway get off at Amanohashidate Station. Ride the site seeing boat for 12 minutes and get off at Ichinomiya, or take the Tankai Bus towards Ine routes 2-9 for 20 minutes, get off at Jinja-mae and walk 10 minutes. ・Kyoto→R９Kyoto-Jukan-do→R27→Ayabe JC→Kyoto-Jukan-do Expressway Miyazu Amanohashidate interchange→Amanohashidate　About 2 and a half hours. 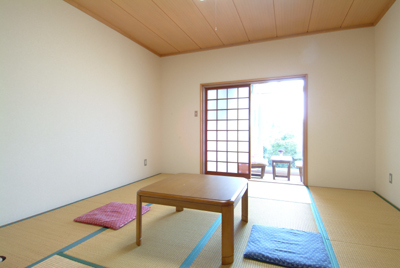 ※ For families and groups wishing to share 1 room there is a surcharge of 2,000 yen per night per room. What is a “youth hostel”? The “youth hostel” movement started in Germany and spread worldwide through people’s travels as a peaceful activity to freely gather and deepen mutual understating by transcending differences of race, nationality, religion, etc. Three are currently about 4,400 youth hostels worldwide where you can stay for cheap even alone, about 320 in Japan, and 5 in Kyoto. 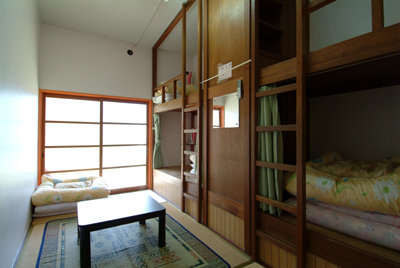 The accommodation rate is about 3,000 yen a night (up to 4,500 yen with two meals included) and is very economical to use. What kind of place is a youth hostel? Guest rooms are basically gender separate share rooms for from 4 to 8 people. There are places prepared for guests to cook their own food, conveniently do laundry after a long trip, a common area to get together and exchange information and interact with each other. Youth hostels are a hub on young people’s travels where they experience the various countries’ cultures and lifestyles through the many opportunities to meet others. Also, there are youth hostels with family rooms and rooms they can share together. You can bring your own toilet kit and sleepwear, or borrow them from the youth hostel. How can I use a youth hostel? 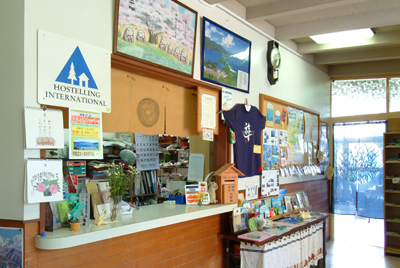 To use a youth hostel as a basic rule you need a membership, but even non-members can use them by purchasing a visitor stamp (only in Japan). If you become a member you can stay at the member rate throughout the year. Also, for youth hostels managed by local governments, members and non-members can stay for the same price. What should I do to become a member? Anyone can get a membership through simple procedures. You can enroll at each youth hostel, at the nearest youth hostel association information desk in each prefecture, or on the internet. Youth hostel membership is universal and you can use it at youth hostels all over the world. Can women alone and families stay? Women traveling alone can feel rest assured using youth hostels. Youth hostels welcome people traveling alone. They can become friends with other guests and there’ll be no loneliness of traveling alone. A common feature of youth hostels is there are chances to meet others and become friends you can enjoy your travels with. Can a family stay in the same room? Using youth hostels isn’t just for young people. Use of youth hostels is increasing among families who cherish their travels with children and together with the family. Every youth hostel is increasing family rooms in response to their increased use. If you would like to request a family room, please let the youth hostel know when you make your reservation. (There may be a surcharge). If your family has to stay in separate rooms, it can become a valuable chance for children to interact with other roommates and develop independent minds. How to I apply to stay? Reservations at youth hostels are generally accepted from 90 days prior to your stay. Please ask the hostel you will stay at first by email or phone. If you’re making a reservation please let them know the number of male and female guests, number of days you’d like to stay, if meals are needed or not, your name, your phone number, etc. Also, if time allows until your lodging dates, if you apply via a reply-paid postcard you can receive information from the youth hostel along with an answer and confirmation of your reservation. 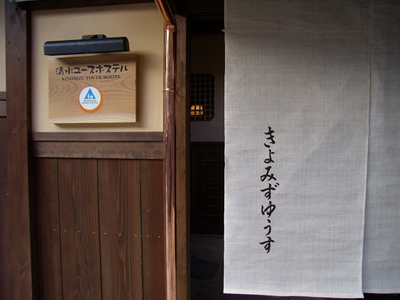 What kind of youth hostels are in Kyoto? 3 others within Kyoto City. 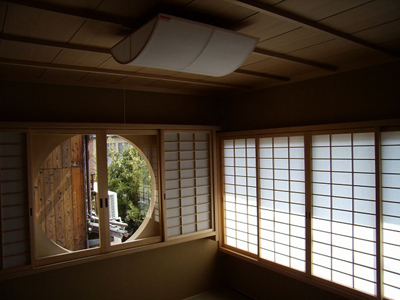 The youth hostels have various individual characteristics such as a 200 year old relocated thatched roof home, a machiya style building harmonious with the surrounding scenery and completely renovated ones expressing their “Kyoto-ness”. Please include these stops in your travels. Also, at each youth hostel there are events and projects ongoing in the area. 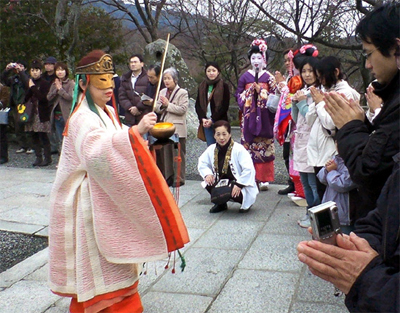 Please enjoy your trip in Kyoto, the abundant nature, unique strolls around the city, joining in local festivals, tours for fishing and outdoor hot springs, its history and culture. ©Copyright 一般財団法人京都ユースホステル協会 2012 All rights reserved.